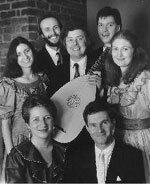 Top row: Evelyn Tubb, Rufus Müller, Anthony Rooley (with lute), Alan Ewing, Emma Kirkby. Bottom row: Mary Nichols, Andrew King. The Consort of Musicke was founded twenty-five years ago in 1969 by its director, Anthony Rooley. Over the years the Consort has gone from strength to strength. After the first ten years The Guardian said: 'Few have done as much to revive the sensibility and thereby the stature of early English music as Anthony Rooley and his Consort of Musicke'. Since then the accolades have continued, not only for performances of English works but also for the Italian repertoire they have so consistently championed: 'They could have no better opportunity to demonstrate their skill than in the magnificent madrigals by Claudio Monteverdi. Attention to clarity of pronunciation and the natural rhythmic movement of the Italian language… has always been a strength of the group' (Early Music News). Whatever the repertoire, there has been constant praise for the group's vitality, excitement and progressive exploration: 'There were times in this performance when the group seemed to be turning the hinges of revelation' (The Sydney Morning Herald). Perhaps one of the greatest contributing factors to the group's success is the consistency of its personnel. Despite their pursuit of individual careers, the members have continued to work together to create an ensemble in which the singers know each others' voices intimately. This gives the group the same profound advantage for refined and spirited chamber music-making as is enjoyed by the most respected string quartets. Sopranos Emma Kirkby and Evelyn Tubb, alto Mary Nichols, tenors Joseph Cornwell and Andrew King, and bass Simon Grant form the nucleus of all the Consort's work, spending much of the year touring at home and abroad. The Consort's busy schedule includes visits to Germany, Italy, Austria and Israel. They appeared at the York Early Music Festival, as well as at the Flanders Festival in Belgium (August 1996). An abundance of recent recordings is another illustration of the group's productivity. No fewer than twenty recordings have been made for Musica Oscura, the record label established in 1993 by Anthony Rooley in joint partnership with Arjen Terpstra. The latest of these was a co-production with the BBC in a re-working of Cervantes' novel Don Quixote, with music by Henry Purcell and his London contemporaries. This partnership has also seen the production of the Consort's first film, Banquet of the Senses, a recreation of Monteverdi's Madrigali erotici e spirituali set in the beautiful Palazzo Te in Mantua.